After a day of moderate gains yesterday after OPEC’s comments provided some strength to the market, prices are lower across-the-board this morning. Crude oil gained 27 cents during yesterday’s trading session, closing the day higher at $61.90. However, crude gave up those gains and more this morning, opening 46 cent (.74%) lower, and is currently trading at $61.33. Similar to crude, products also saw gains on Tuesday. Diesel prices gained over a penny, while gasoline also rose by just 14 points. Today, both products are slowly creeping down into the red, though with minimal losses of less than a penny combined. 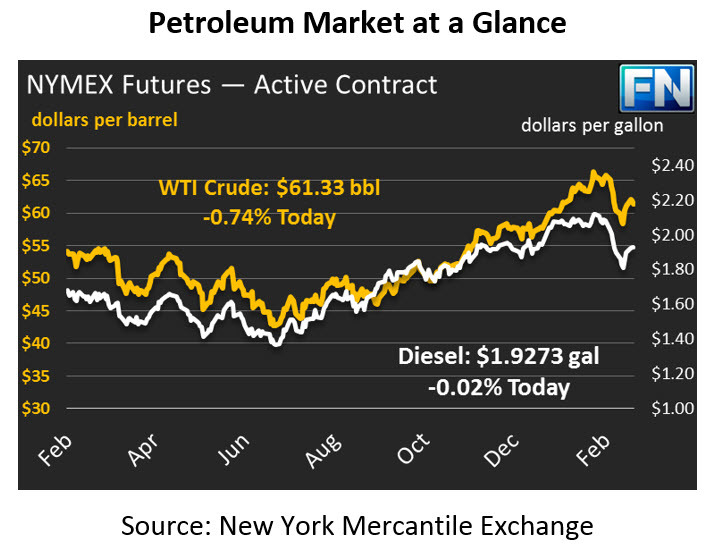 Gasoline is currently trading at $1.7419, while diesel prices are $1.9273. The market’s attention is turned to the API report that will be coming out later today (a day late due to Presidents Day on Monday) and comments made by members of OPEC. Markets are expecting a net inventory draw, with crude building yet again by 1.3 MMbbls, and products drawing by 2.2 MMbbls. The OPEC meeting is scheduled for June 22nd in Vienna, Austria and the topics of discussion will most likely include current production cuts and the future of the supply cuts after the deal expires in 2018. OPEC’s head of research told a conference yesterday that compliance reached a record high of 133 percent in January, helping to bring OECD oil stocks down to 74 million barrels above the five-year average last month – the smallest surplus reported since the cuts began. For reference, the oil stocks were 340 million barrels above the five-year-average this time last year. In addition to these comments, OPEC’s President announced that Russia, UAE, and Saudi Arabia intend to extend their supply cuts beyond the expiration of the deal.